Kim Kardashian‘s reality shows are staged? Oh my god, say it isn’t so! Yup, we’re pretty good at sarcasm right? Well, finally we’re getting somewhere now that a former producer at E! confirmed that several scenes were scripted on Kim’s Kourtney and Kim Take New York season 2 where she infamously appeared on with ex-husband Kris Humphries. 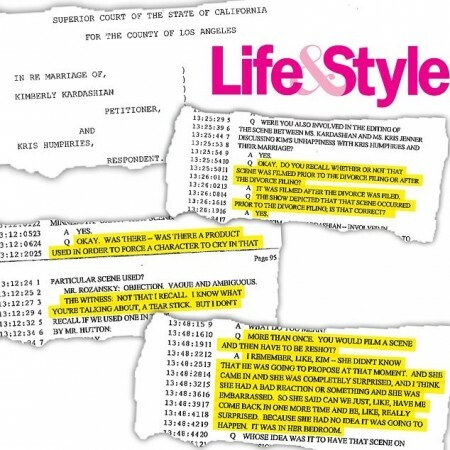 The producer, named Russell Jay, confirmed in the 165 page deposition, which will be present at May’s court hearing for the couple’s divorce, that Kris is correct, the producers of the show did edit scenes to make him look bad so that Kim’s fans wouldn’t end up turning their back on her and, most importantly, the reality star was very worried on how this divorce could affect her brands and businesses, which is why she spoke with her momager Kris Jenner who had the idea of editing scenes to make Humphries the bad guy. It’s pretty pathetic, when you consider the fact that these reality stars are on a REALITY show; cameras follow their everyday lives and air it on television. They shouldn’t have to re-edit scenes to make a particular person look bad because the couple were no longer together. It’s ridiculous, yet we have no reason not to believe this producer who has made these claims to Life&Style, because back in January, 2012, Kim and her mom made their way to an E! studio to film scenes of the two making their way back to Los Angeles from their trip to Dubai. In the clip, Kim can be seeing confessing to her mom that she doesn’t feel marriage with Kris is what she really wanted, while Kris assures her that it’s totally her decision whether or not she wants to end things or not. Kris Humphries has scored a huge victory in his fraud case against former wife Kim Kardashian. The deposition provided plenty of evidence to bolster Kris’ claim that Kim, 32, married him just for publicity. Jay confessed that not only was Kim aware of Kris’ “surprise” proposal beforehand, but she re-shot the scene because she didn’t like her reaction in the initial take. The document also reveals she created scenes from scratch. During one memorable TV moment, Kim confessed to her mom, Kris Jenner, that she was struggling in her marriage… but in the deposition, Jay says the scene was shot after Kim filed for divorce in 2011. In another episode, Kim was furious to discover Kris threw a party in their hotel room while she was out of town. Jay admits Kim was actually in the hotel when it went down and aware of everything. Even though Kim will be seven months pregnant with beau Kanye West’s child, she’ll head to court on May 6 to defend herself.